Saturday night is the San Diego Derby Dolls 2015 season opener! Watch our all-star team, the Wildfires, take on Seattle’s Tilted Thunder Rail Birds at 7:30pm. Fans should be excited to see the introduction of new Wildfires #350 Kupcake Kaboom, and #182 Nova. The Tilted Thunder Rail Birds are captained by veteran skaters #808, Catti LaBelle and #503, MK Ultra. 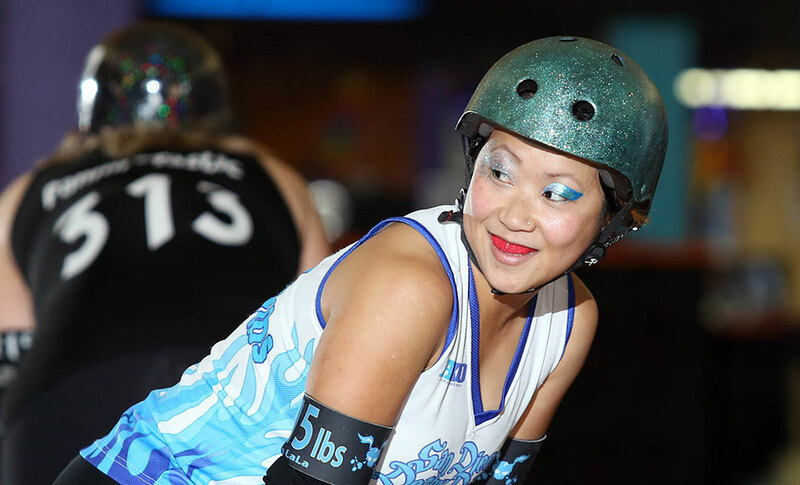 They will feature all-stars #13 Creep Suzette (jammer) and #111, Smolderine (blocker) fresh from their stint with the RDCL All Stars at Jantastic. Doors open at 6:30pm and the bout starts at 7:30pm. Be sure to come on down and check out these ladies as they fire it up for their first home game! This bout will be held in our private Dollhouse in downtown San Diego, open to only 200 of our closest friends & family. Street parking is free after 6pm. Don’t forget to arrive early to check out the newest apparel at our merch stand and our vendors in our Vendor Village on the flat track under the disco ball! A concession stand will be full of pizza, popcorn, and soda for all your hunger pains. All ages are welcome and there is free admission to children 5 and under!